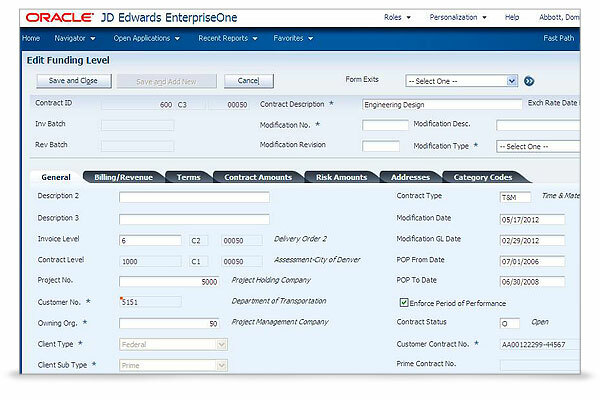 JD Edwards Financial Management is the accounting component of Oracle's JD Edwards EnterpriseOne (JDE e1) product line. This component can serve businesses of any size. The system is horizontal; it is designed to serve the needs of a wide variety of vertical markets. This program is scalable and can adapt as the user company grows. Financial Management offers applications for accounts payable, accounts receivable, advanced cost accounting, expense management, financial management and compliance, fixed asset accounting, and a general ledger. The system can support multiple languages and currencies. The program also supports International Financial Reporting Standards (IFRS) requirements, with capabilities such as asset componentization and inventory costing methods. 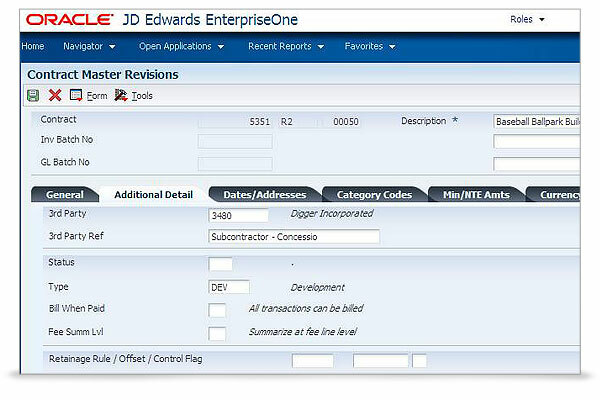 JDE e1 uses the Oracle Technology Foundation, a package of integrated products that allow implementation and maintenance of system applications. This foundation is made up of the Oracle Database 11g, Oracle Fusion Middleware, and JDE EnterpriseOne tools. The HTML server and web client for Financial Management allow users to access the system’s applications with a web browser. Only JD Edwards EnterpriseOne offers more choice of databases, operating systems, and hardware so you can build and expand your IT solution to meet business requirements. JD Edwards delivers over 80 application modules to support a diverse set of business processes and key industry solutions such as Consumer Package Goods, Manufacturing, Asset Intensive, and Projects and Services. Financial Management Having the right financial foundation for your organization is key when you need to account for every penny that comes in or goes out—in every currency, in every country. Oracle's JD Edwards EnterpriseOne financial management solutions can help you respond more quickly to your changing environment, streamline your financial operations, and improve the accuracy of your financial reporting. Project Management Take control and proactively manage project costs and billing, from conception through completion with Oracle's JD Edwards EnterpriseOne project management applications. Asset Lifecycle Management Oracle's JD Edwards EnterpriseOne Asset Lifecycle Management solution helps drive greater value from your assets, whether they are plants, facilities, or equipment. From capital planning and budgeting, to procurement and operations, to maintenance and repair, JD Edwards EnterpriseOne Asset Lifecycle Management can maximize profitability and return on investment across the entire asset lifecycle. 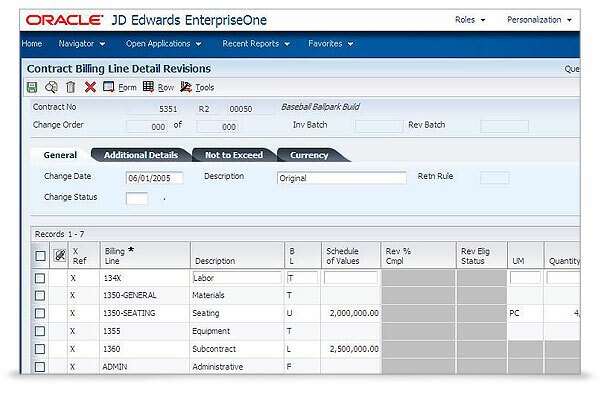 Order Management Oracle's JD Edwards EnterpriseOne Order Management enables you to streamline order processing and maintain visibility and control of order tracking throughout the order lifecycle. Manufacturing Management Oracle's JD Edwards EnterpriseOne Manufacturing and Engineering helps manufacturers—especially those that operate within a mixed-mode (process, discrete, repetitive, etc.) manufacturing environment—develop, manufacture, and distribute products in a timely fashion; use efficient processes that optimize resources; and satisfy customer expectations about quality, price, and delivery. Now, with the addition of Oracle's Agile Product Lifecycle Management solutions, engineers can work closely with the manufacturing and related capabilities of JD Edwards EnterpriseOne. Mobile Solutions Oracle's JD Edwards EnterpriseOne Mobile Solutions deliver personalized services that extend user choice and improve productivity by delivering management solutions that can be accessed at any time or from anyplace. 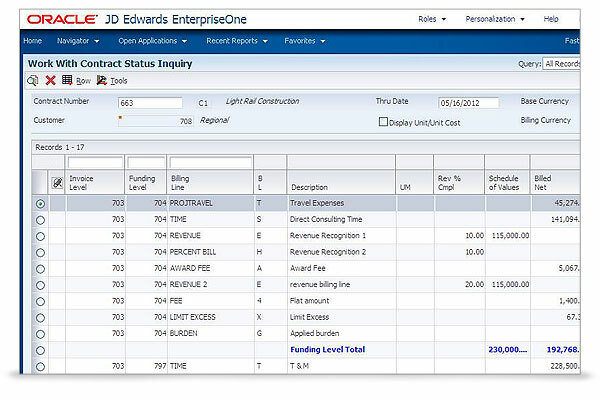 Reporting Oracle's JD Edwards EnterpriseOne One View Reporting is a real time operational reporting solution designed specifically for end users to access and personalize transactional data into lists, charts, graphs and tables thus simplifying the consumption of information. One View Reporting's intuitive interface empowers end users with the flexibility to create personalized operational reports, across EnterpriseOne, without the need for IT assistance.